The Saints will play Sunday for their third consecutive NCAA Championship. We really like the height and mixture of the Legion system from Shaw Sports Turf. The different characteristics provided by the slit and monofilament fibers help us with all the sports we play on the field. The virtually unstoppable Limestone Saints will play in their third consecutive NCAA Lacrosse Championship on Sunday in a rematch of last year’s title game against LeMoyne College. The Saints reached a record high number of wins by dispatching the University of Tampa in last weekend’s semi-final matchup. The top-ranked Saints, who practice and play on a Shaw Sports Turf field at the Gaffney, South Carolina school, are 21-0 on the season. The Saints are 60-2 over the past three seasons. This will be their tenth time playing for the national championship in seeking their 5th title. Limestone College paved the way for the sport of lacrosse in the South. In 1990, they became South Carolina’s first collegiate lacrosse team. They have earned an amazing 18 straight regular season conference titles. They have also won conference tournament championships in 1994, 2000-2007, and 2009-2016. Their previous national championship titles came in 2000, 2002, 2014, and 2015. The 2000 title gave Limestone claim to the smallest co-educational institution to win a national championship. The 2002 team was responsible for most of the fundraising for the new Shaw Sports Turf field. 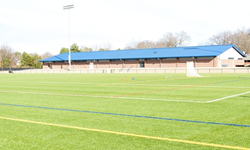 A combination of over-use and the need for new facilities prompted the move to Shaw Sports Turf. The men’s lacrosse team will share the field with the women’s lacrosse team, men’s and women’s soccer, and field hockey. The Saints utilize Shaw Sports Turf’s Legion system, which is a combination of high-performance monofilament fibers and a durable slit film fiber. The slit film fiber is a workhorse which handles the workload, while the monofilament provides a more resilient surface that enhances performance characteristics. The championship game is set for this Sunday at Lincoln Financial Field in Philadelphia.